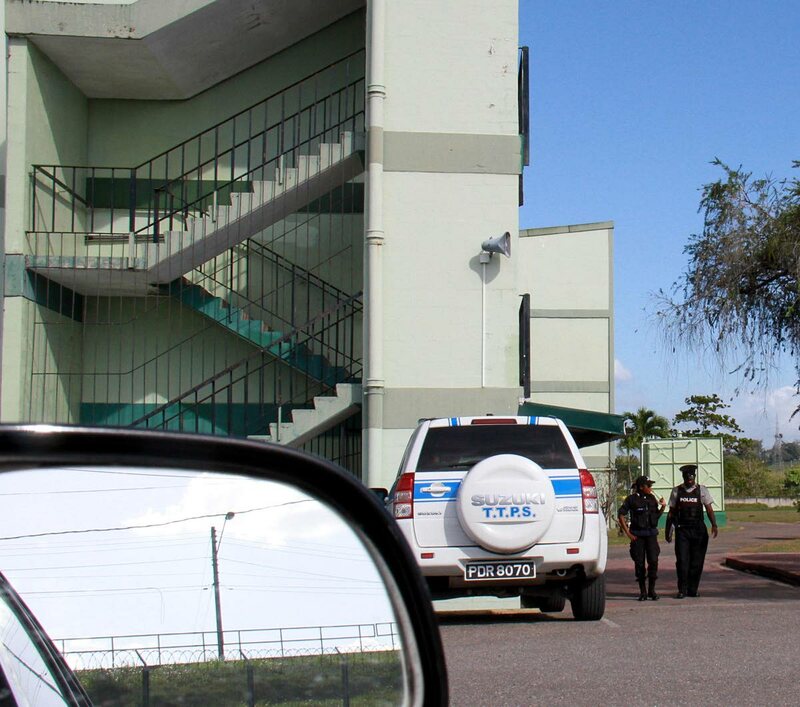 Police officers at Ste Madeleine Secondary school yesterday after a pregnant teacher had to flee from a parent armed with a piece of wood. A PREGNANT teacher of Ste Madeleine Secondary school had to call in police yesterday to rescue her from irate parents, one of whom was armed with a piece of wood and who threatened to beat her. The traumatised teacher said she was accosted by parents in the administrative office shortly before 2.30 pm, as classes were about to end for the day. The teacher said that earlier in the day, she was called into a meeting after a student claimed she (the teacher) had insulted her. “I went into the office about half an hour after I was paged. When I got there, a parent was talking to the school principal,” the teacher said. The teacher said that as a school official pointed in her direction and said, “that is she”, the parent started carrying on. “The parent said I called her daughter names. She was cursing and I asked the principal if she would allow this and the principal replied, ‘let’s hear what the parent has to say’,” the teacher said. She said the parent left but not before telling her, “I will get you after school on the hill.” The teacher said she that at 1.30 pm, she went to the Ste Madeleine Police Station and made a report. Officers advised her to return to school to ensure she and the principal were present when they visit to investigate. The teacher said she returned to school and went to the administrative office to await the police’s arrival.“I saw the parent who told me that the principal had called her back to school. I told her she should sit and wait until the principal called for us in but this angered her and she stormed out of the office,” the teacher said. The parent returned with a piece of wood and with the backing of other parents, she started to shout at the teacher saying, “you not leaving here today.” The teacher, who is six-months pregnant fled to the staff room where she was met by four colleagues who said they would stay with her until the police arrived. When the officers arrived, the wood had disappeared and the teacher was escorted from the staff room to her car while several parents stood by and watched. “The police drove behind me for a long distance because I didn’t know if the parents were going to follow me, I was so scared,” the teacher said. She is now afraid to return to classes. Education Minister Anthony Garcia referred Newsday to his communications department saying he was in Jamaica attending a meeting at the University of the West Indies, Mona campus. A source in the ministry’s communications department confirmed the incident but said the report they received from the school differed from the teacher’s version. The report the ministry got was that a student had complained about being insulted and that student’s parent came to the school. The report added while there were “raised voices” there was no threat made or any weapon brandished. The Schools Supervisor for that education district is investigating. Efforts to contact TT Unified Teachers’ Association president Lynsley Doodhai yesterday were unsuccessful as Doodhai did not respond to calls or Whatsapp messages sent to his cellphone. National Parent Teacher Association (NPTA) president Raffiena Ali-Boodoosingh said she was not aware of the incident but added that the NPTA does not support abusive action on the part of either parents or teachers.